(Nanowerk News) A common algae commercially grown to make fish food holds promise as a source for both biodiesel and jet fuel, according to a new study published in the journal Energy & Fuels ("Production of Jet Fuel Range Hydrocarbons as a Coproduct of Algal Biodiesel by Butenolysis of Long-Chain Alkenones"). The researchers, led by Greg O'Neil of Western Washington University and Chris Reddy of Woods Hole Oceanographic Institution, exploited an unusual and untapped class of chemical compounds in the algae to synthesize two different fuel products, in parallel, a from a single algae. "It's novel," says O'Neil, the study's lead author. "It's far from a cost-competitive product at this stage, but it's an interesting new strategy for making renewable fuel from algae." Algae contain fatty acids that can be converted into fatty acid methyl esters, or FAMEs, the molecules in biodiesel. For their study, O'Neil, Reddy, and colleagues targeted a specific algal species called Isochrysis for two reasons: First, because growers have already demonstrated they can produce it in large batches to make fish food. Second, because it is among only a handful of algal species around the globe that produce fats called alkenones. These compounds are composed of long chains with 37 to 39 carbon atoms, which the researchers believed held potential as a fuel source. Biofuel prospectors may have dismissed Isochrysis because its oil is a dark, sludgy solid at room temperature, rather than a clear liquid that looks like cooking oil. The sludge is a result of the alkenones in Isochrysis -- precisely what makes it a unique source of two distinct fuels. Alkenones are well known to oceanographers because they have a unique ability to change their structure in response to water temperature, providing oceanographers with a biomarker to extrapolate past sea surface temperatures. But biofuel prospectors were largely unaware of alkenones. "They didn't know that Isochrysis makes these unusual compounds because they're not oceanographers," says Reddy, a marine chemist at WHOI. Reddy and O'Neil began their collaboration first by making biodiesel from the FAMEs in Isochrysis. 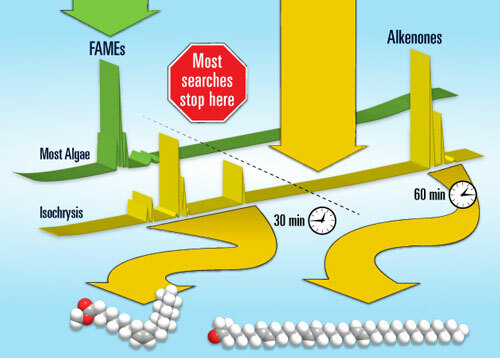 Then they had to devise a method to separate the FAMEs and alkenones in order to achieve a free-flowing fuel.The method added steps to the overall biodiesel process, but it supplied a superior quality biodiesel, as well as "an alkenone-rich . . . fraction as a potential secondary product stream," the authors write. "The alkenones themselves, with long chains of 37 to 39 carbons, are much too big to be used for jet fuel," says O'Neil. But the researchers used a chemical reaction called olefin metathesis (which earned its developers the Nobel Prize in 2005). The process cleaved carbon-carbon double bonds in the alkenones, breaking the long chains into pieces with only 8 to 13 carbons. "Those are small enough to use for jet fuel," O'Neil says. The scientists believe that by producing two fuels--biodiesel and jet fuel--from a single algae, their findings hold some promise for future commercialization. They stress that this is a first step with many steps to come, but they are encouraged by the initial result. "It's scientifically fascinating and really cool," Reddy says. "This algae has got much greater potential, but we are in the nascent stages." Among their next steps is to try to produce larger quantities of the fuels from Isochrysis, but they are also exploring additional co-products from the algae. The team believes there are a lot of other potential products that could be made from alkenones. "Petroleum products are everywhere--we need a lot of different raw materials if we hope to replace them," says O'Neil. "Alkenones have a lot of potential for different purposes, so it's exciting."